View the entire table of contents for the Nov. 30, 2006 issue. You've purchased a French barrique to use as a tasting table. You've decided on slate from California for the floor. You've even found an antique oak door decorated with wrought iron to enhance the entrance. You've made sure your dream cellar will be beautiful, but are you sure that it will protect your wine? 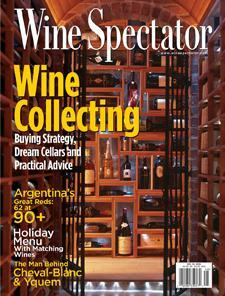 For the full article, check out the new issue of Wine Spectator, on newsstands November 30, 2006.